Designed by hydrofoilers, for hydrofoilers the Ripper Foilboard is made with the same care and materials all our proven models of sit-down hydrofoils are made with. 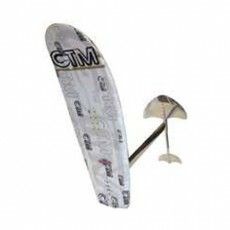 The newly designed compression molded board is reinforced in the tail section and even has an aluminum socket molded into the core to accept the foil. Strong & Lightweight (these boards weigh in at just over 10lbs), this board is the first of its kind. The Ripper features a 2 pc billet foil with bolt together T-bar with a 39" strut, 24" fuselage, the Limited Edition "Max-air" front wing and Launch Bat rear wing. (Also available with option 30" or 36" fuselage) Designed to be used with standard snowboard boots & bindings (not included).